St. Paul of the Plains Chapel - LUBBOCK MEMORIAL ARBORETUM ...A LIVING TRIBUTE TO EVERYTHING THAT IS BEAUTIFUL! Built in 1913, St. Paul's on the Plains Episcopal Church is the oldest existing church building in Lubbock. The first site of the building was on the southwest corner of 15th Street and Avenue O. In 1927, the building was relocated to 1609 Avenue O and expanded to accommodate a growing congregation. In the late 1930's the present St. Paul's on the Plains Church at Avenue X & 17th Street was built where services are still held. The original building was sold to A.M. Leftwich, Sr. in 1940 and remodeled into apartments removing most of its distinguishing features. Since Mr. Leftwich's death in 1987, the building fell into disrepair due to vandalism and lack of maintenance. In July 1989 the building drew the attention of the Lubbock Heritage Society who began researching the condition and the cost to relocate and restore the building. 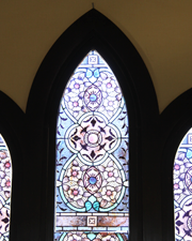 In 1996, the church was moved to its present location at 40th & University and was completely restored. It took a great deal of donated time, money, and volunteer services to see the project to completion. The church became available for rental to the public in August of 1997. St. Paul's on the Plains is located in K.N. Clapp Park, 40th & University. 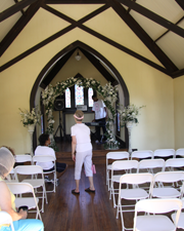 It is available to rent for small weddings, meetings, and receptions. Contact the Garden and Arts Center at 767-3724 to reserve St. Paul's on the Plains for your wedding, meeting or reception. We recommend that you contact them early in your planning process as the calendar of reservations for this facility fills up quickly.